Dale the Doll was bought from an antique shop for my son. He liked spooky things, but apparently not the doll so much. He took it down from the wall shelf and put it in his closet. When he moved out, he asked if I wanted it. I said "SURE!" 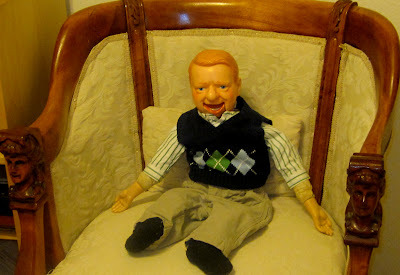 I always hated ventriloquist dolls, but it seemed that I could take this doll and use it as a symbol of my horror writing. I had two big old steamer trunks found in the desert, so I put them near the front door with Dale atop of them as if he were hitting the road for a show. One night, when my then-husband was out of town, my friends visited and said, "we dare you to sleep in the living room near Dale." I tend to take dares. "Sure." They told me to take a picture of him before I went to bed and then when I woke up to see if he moved. Trigger object, eh? Well, I took the picture, went to bed. I awakened during the night to a thump. The room was dark. I turned over on the sofa and fell back asleep. The next morning, my friend called and asked if I took a picture yet. I laughed and went over and took a shot of him and then looked at the two pics and realized his arm had jumped from his lap and the porcelain had hand had slapped the wall. When I shared this with readers of my blog, they got shivers. I realized that Dale creeped everyone out-not just me. And, so the sidekick Dale was born. He wrote posts on the blog (type in "Dale" in the search bar to the top right side of the blog), made YouTube videos and lived to torment me every month of October when he is possessed by the soul of an evil magician. One time, he hid the knives under my bed on a video. People emailed me telling me they didn't want Dale to know they were telling on him, but he hid the knives under the bed! Another asked me "Is Dale from Chicago? He has a Chicago accent." Haha. Readers really enjoy this little demon.